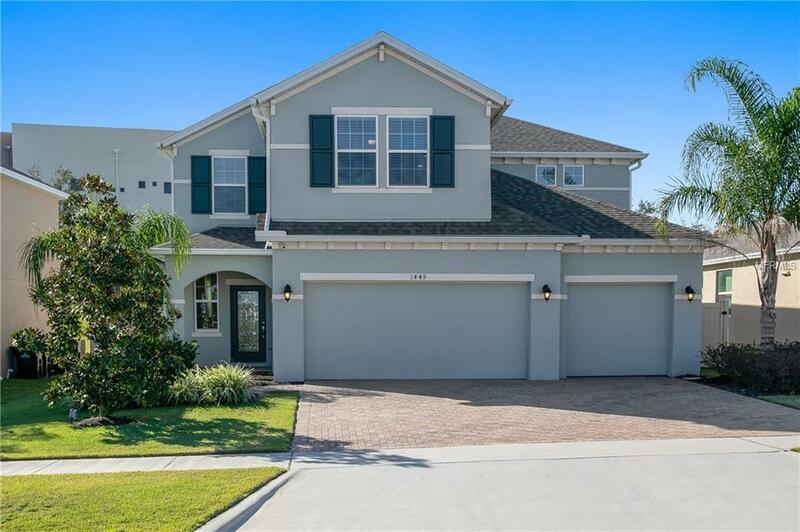 This gorgeous 4 bedroom, 3 bath energy star pool home is a must see!! It is located in the highly sought after Gated Community of Harvest Landing and is within minutes to everything you need. You will feel at home instantly as you walk into this open floor plan. The family, dining, and living room combo with a first floor bedroom are just a few of the details you will notice as you make your way to the chef inspired kitchen area complete with a center island, granite counter tops, under cabinet lighting and stainless steel appliances. Upon entering, the staircase leads you up to the over sized master bedroom, 2 remaining bedrooms, full bathroom, and large loft area. Recent upgrades include ring security cameras/door bell, wired Ethernet to all rooms, attic radiant barrier, and hybrid water heater. The home also has automated lighting, garage door, and WiFi heated pool system with multiple water features. Relax with your family in your saltwater pool on your large pavered patio and enjoy entertaining outdoors on the vinyl fenced-in lot with plenty of room for many activities! The home is move-in ready and represents one of the few homes in the subdivision with a pool. This home will not LAST so call us now for a private showing!! Additional Lease Restrictions See Hoa Covenants And Restrictions For More Details. Pet Restrictions See Hoa Covenants And Restrictions For More Details.